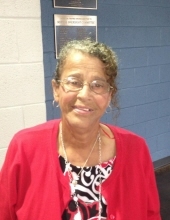 Celebrating the life of Gloria A. Johnson "Ann"
Obituary for Gloria A. Johnson "Ann"
On Thursday, April 11, 2019, in a moment, in a twinkling of an eye, Gloria Annette Johnson, 69, moved from earth to glory, to a home eternal in the heavens. She fought a good fight, she finished her course, and she kept the faith. Gloria Annette Johnson, also knowns as Ann, was born on June 21, 1949, the seventh of 13 children to the late John Othell, Sr. and Viola Lee Johnson. Ann lived in Culpeper all of her life and attended elementary school at Norman Elementary. She attended high school at George Washington Carver Regional High School, and graduated from Culpeper High School in 1969, one year after Culpeper schools were forced to integrate. Ann’s faith was essential to her life and she was a good and faithful servant. She accepted Christ at an early age through baptism. As a young child, she attended Good Hope Baptist Church. Ann loved using her voice to sing for God and did so as a part of the Community Choir. Later as an adult, she joined Free Union Baptist Church. She served in the Senior Choir, the Young Adult Choir, and the Women’s Ministry. In 2009 after Ann became “Grandma” she began attending the Ebenezer Baptist church to aid her daughter and son-in-law to focus on their ministry call, and on June 28, 2015, she decided to make Ebenezer her church home. Ann also had her own special ministry of cake baking. She would prepare her pound, caramel, and famous blueberry cakes for various church services and Pastors. Ann was employed with the Culpeper County School system for 24 years until her retirement; serving at the Culpeper County High School. After she became the Head Custodian and moved from the evening shift to the day shift, an opportunity that allowed her to have an impact on so many lives that walked those halls every day. She was a quiet strength to encourage, correct, and remind students that they had the potential to do anything they set their minds to. She was CCHS proud. You could regularly find her sporting Culpeper “Blue Devil” gear and school colors. After her retirement in 2013, Ann enjoyed her time as “Grandma”. It is what made her day the brightest. She loved spoiling her babies. Even after her health declined in 2015, all she wanted to do was to get better to help take care of her grandbabies. They were her reasoning for fighting and pushing daily to enjoy one more day full of life with them. In addition to her parents, she was preceded in death by four brothers, John Johnson, Jr., James Johnson, Sr., Ronnie Johnson, Sr., Charles Johnson, Sr., one sister, Mertice “Delores” Wilson, one brother-in-law Rev Hugh R Wilson, and one sister-in-law, Bobbi Johnson. Ann is survived by her daughter, Veronica (Robert Sr.) Brown, grandchildren, Robert Jr. and Annyssa Brown; two sisters and five brothers, Arlene (Cookie) Jones (William Jr.) of Sterling, VA, Carolyn (Pat) Bowles (Frankie Sr.) of Reva, VA, Stacy Johnson of Richmond, VA, Melvin Johnson, Sr. of Culpeper, VA, Robert (Pete) Johnson, Sr. of Centreville, VA, Bruce (Raquel) Johnson of Manassas, VA and Brian Johnson of Fairfax, VA, three sisters-in-law, Lucille Johnson, Geneva Johnson and Marian Johnson; two very special cousins, Sandra and Delphine Washington; one Godson, Frankie Bowles, Jr. (Melanease), as well as a host of nieces, nephews, cousins and friends. To send flowers or a remembrance gift to the family of Gloria A. Johnson "Ann", please visit our Tribute Store. "Email Address" would like to share the life celebration of Gloria A. Johnson "Ann". Click on the "link" to go to share a favorite memory or leave a condolence message for the family.